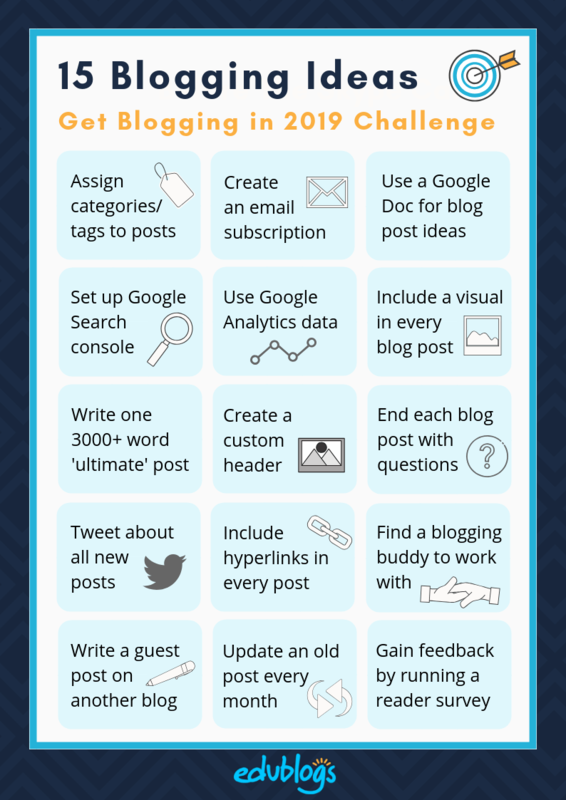 Congratulations to all our “Get Blogging in 2019 Challenge” participants! They’ve worked hard over the last 28 days to complete the steps on our kick start calendar. 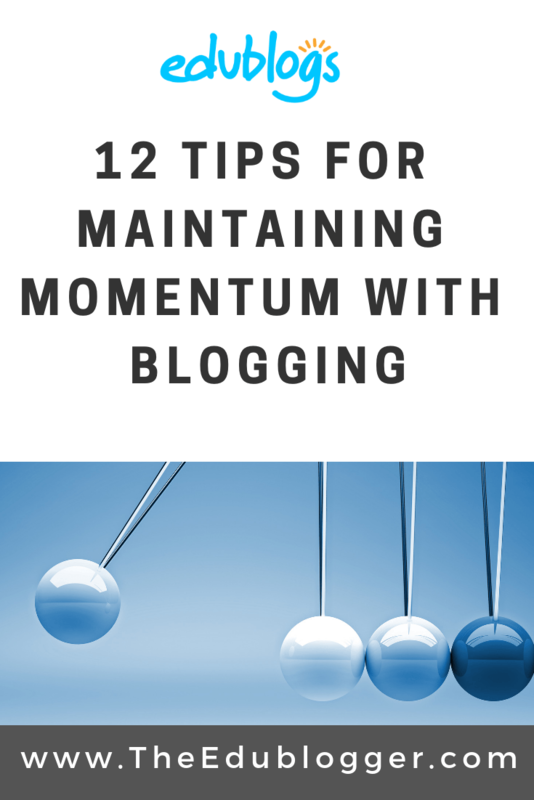 This post shares 12 tips for maintaining momentum with blogging. Did you miss the chance to take part in the January challenge? Don’t worry! Why not do it in February? You can start at any time. Go back to this post to find out more. Feel free to tag us in your tweets so we can check them out and share with others. We’ll run another supported challenge in the second half of the year. So look out for that on The Edublogger or in our weekly email newsletter. 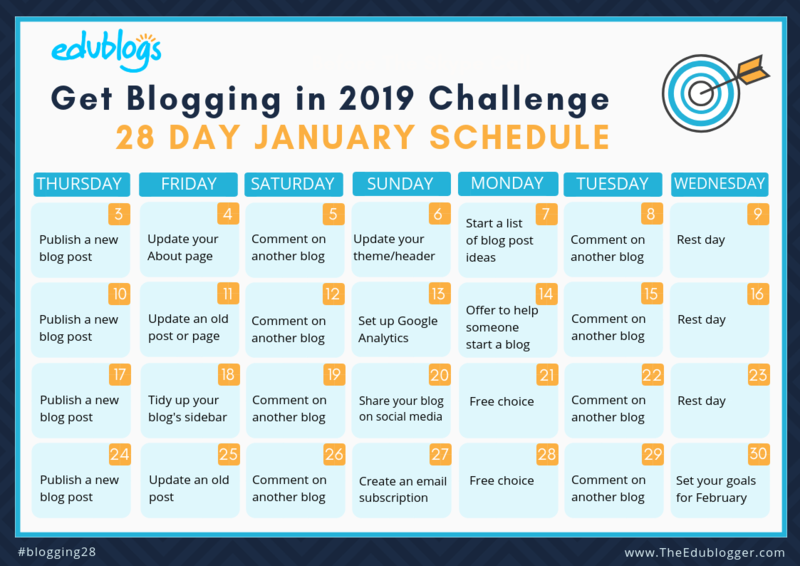 So you’ve made it this far and started 2019 with a great start to blogging. How do you keep it going? Here are 12 tips to offer you some inspiration. Different things work for different people and we’d love you to share your own tips in a comment! Imagine what you could accomplish by the end of the year if you did a little bit of work on your blog each day! This doesn’t mean publishing a post daily but it might mean starting a post, writing a list of post ideas, commenting on other blogs, updating the design of your blog, updating an old post or page, sharing your blog on social media. Yep, all the sorts of things we were doing in the 28 day challenge! 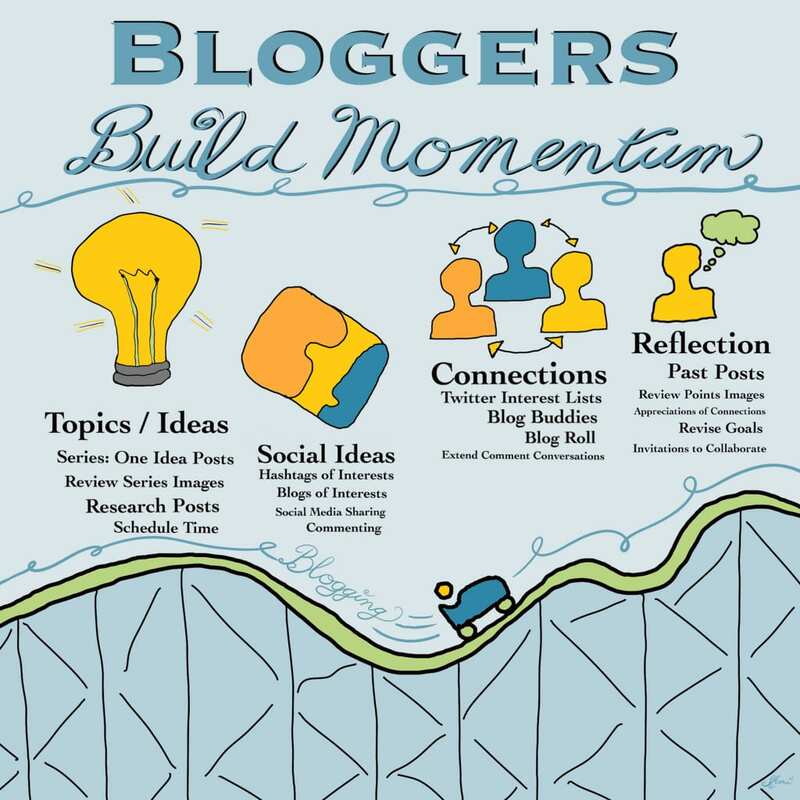 This poster also gives you ideas of tasks you could work on to improve your blogging in the months to come. Have you heard of the “don’t break the chain” method for productivity or to get hooked on a habit? You set yourself a mini goal (like working on your blog for 10 minutes a day). Every day you complete your goal, you mark off that day on a calendar. The longer the chain your build, the harder it will feel to break the chain. Before you know it, the habit will be in place! It’s thought that Jerry Seinfeld came up with this method and advised an aspiring comedian to write one joke a day and mark it on a calendar. Apparently, Jerry has since said that he did not come up with this method. Still, it remains popular and is a key way many social media, game, and app developers get users hooked. If you want to try creating a chain on your phone, there are a number of apps available like this one. If blogging is important to you, then don’t put it at the bottom of your list of priorities after you complete all your grading, preparation, and other administrative tasks. We know a teachers’ work is never done so sometimes you need to refocus your priorities. Many well-known writers have talked about scheduling a daily habit into their calendars. For example, John Grisham is famous for waking up at 5am to write one page of his novel before heading to his day job. Many bloggers enjoy the same sort of approach and find it to be an enlightening way to start the day! Not a morning person? No problem! Schedule your blogging session whenever you can but make it happen. Goals can be so much more enjoyable when tackled with someone else. Why not ask a friend or colleague if they’d like to blog with you, or help keep you accountable by having a weekly check-in? This could be someone you know in your local community or a member of your global PLN. You might be able to brainstorm ideas with your buddy, seek advice, or promote each other’s work. Publically announcing that you are blogging regularly can be a great motivator to make it happen. For example, I send out a monthly email newsletter to readers of my own blog. I explain that this newsletter will share the posts I’ve written during the month. For me, this is motivation to make sure I have content to share each month. Maybe you’d like to try a similar approach, or simply announce to your Twitter followers or colleagues that they will find a new post on your blog every week/two weeks/month. You pick the time frequency that will work for you. Well-known author Gretchen Rubin often talks about the strategy of “treats” when trying to form positive habits. A treat is different from a reward, which must be justified or earned. A treat is a small pleasure or indulgence that we give to ourselves just because we want it. Treats give us greater vitality, which boosts self-control, which helps us maintain our healthy habits. Perhaps you can treat yourself after you publish your weekly blog post with a movie, a game, or a catch up with friends. In this post, Gretchen talks about the idea of finding healthy treats that you enjoy. It will keep your goal of “being a blogger” at the front of your mind if you surround yourself with other bloggers. You can get new ideas for your blog from others. Just as student bloggers often look to one another in class and ask, “how did you do that?”, you can do the same. You’ll begin to develop an authentic audience which can be very motivating as a blogger. Remember the golden rule though, if you want to have an audience, you also need to be an audience. Sometimes it can be hard to think of what to write about. You might be facing a clear case of “blogger’s block” or perhaps you have lots of big ideas that you’re not sure how to transform into posts. Look to others for blog post ideas. You might read something on someone else’s blog, in a comment, or on Twitter that strikes a chord. Perhaps you feel like you have more to say on the topic. Go for it! Don’t forget, we have two sets of blog post prompts for educators that might also help keep the ideas flowing. Find the 2018 edition here and the 2017 edition here. If you’ve been blogging for a while, you might start to get tired of the same old process. Why not try something new? Perhaps you could make a video for your post. Meredith Akers has recently shared some great tools here and we also have a guide to using videos in your blog posts. Alternatively, you might like to make an audio recording with a tool like Anchor. Or, you could explore the range of fun web tools that are out there to edit images, make comics or cartoons, make polls and so on. Check out Step 7 of our Teacher Challenge course for educators to learn more about cool tools to embed. I do. I want to be able to think out loud in the midst of community. I draft and edit but give myself permission to publish something unpolished. If you get nervous about publishing your work for a public audience, perhaps it’s time to stop hovering over the publish button and just do it. It’s only a blog post, you won’t be getting a grade. And there’s an edit button! If you allow perfection paralysis to take over, then you won’t end up enjoying all the benefits of blogging. What a powerful message to send to your students to show them that you too put your work out there and no one is perfect. Are you the sort of person who gets ideas during the night? Or perhaps when you’re doing the dishes or folding the laundry? Many bloggers find it useful to have an ongoing list where they can jot down ideas for posts and other blogging tasks they’d like to tackle. This can be a simple notebook, a Google Doc, or perhaps an app on your phone. Use whatever suits you best. Having an ongoing list means you won’t forget great ideas and won’t waste precious time when you sit down at your scheduled time to start work. Don’t sit down at the computer without a plan. With your list at hand, you’ll always have something to work on. To reflect and develop your thinking? To be a role model for students as digital citizens and writers? To learn through researching and writing authentically for an audience? To build a home base for all your work or a digital portfolio to further your career? To become comfortable with blogging before introducing it into the classroom? When you feel like giving blogging a miss, remember why you started in the first place. It’s worth it! As I was writing this article, I asked #blogging28 participant, Sheri Edwards for her tips. She began blogging in 2007 and still blogs very regularly. This will be so helpful for bloggers, Sheri! You obviously have a great routine for blogging so regularly too. 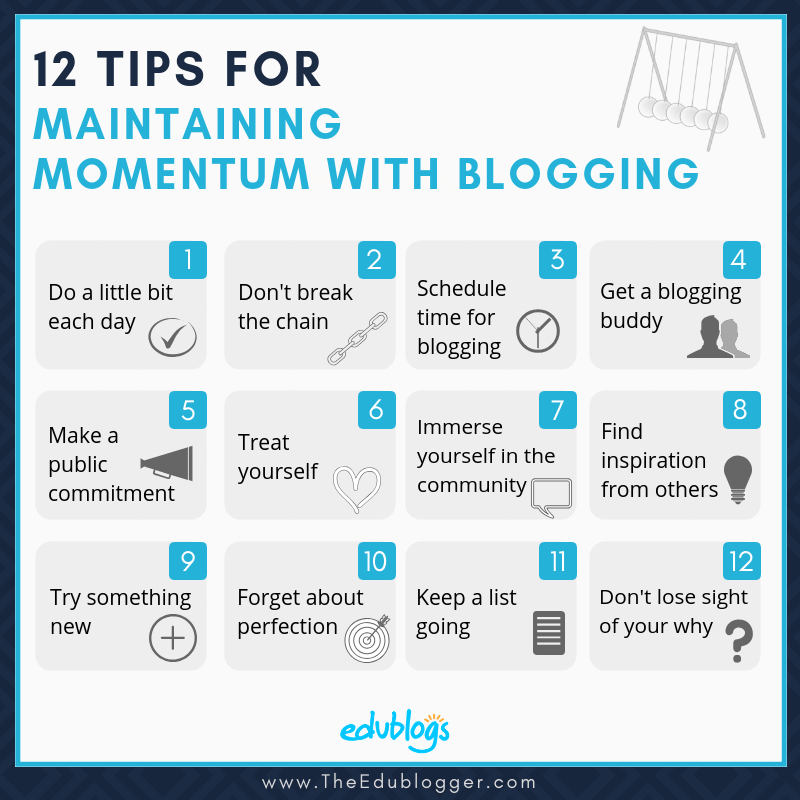 I’ve just written a post for The Edublogger with tips on maintaining momentum with blogging. How do you do it? Do you have scheduled time each day? Instead of replying to the tweet, Sheri blogged about it! And not just with one post, but with a series. The challenge is over but the community doesn’t have to unravel. Feel free to keep the conversations going on Twitter with the hashtag #blogging28 and tag @edublogs. You can also subscribe to our Twitter list of participants to keep in touch with what they’re up to. 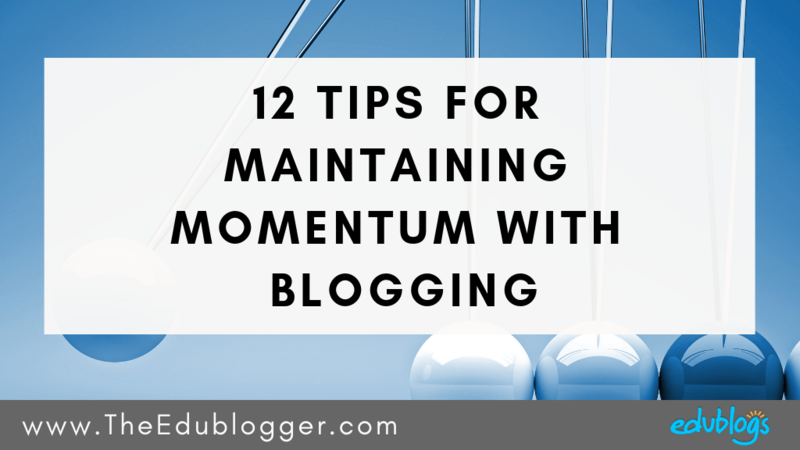 Scroll down to find the comment box and share your favorite tip for maintaining momentum with blogging. Or perhaps you’d like to share the goal you’ll be working towards this year. We’d also love to know if you enjoyed the challenge or would like to be part of another one in the future. Edublogs and Kathleen, Thank you as always for building a community of bloggers who inspire others with their many interests shared on their blogs, interests that others learn from and connect to, creating a better world for all of us. I’m honored that you’ve included a link to the Momentum Series, inspired by Kathleen’s tweet. In the fifth part of the series, I reflect on my efforts in #blogging28 and it includes a big thanks to you, Edublogs and Kathleen. I offer suggestions for reflection, with my own reflection in each section. I hope it inspires others to reflect on our experience as well. Thank you so much for your rich contribution to this topic, Sheri! I have added part 5 of your series to the post now. I know our readers will really enjoy going through your insights and advice! You’re such a generous member of the educational blogging community. Thank you!